Sleepless night here, our youngest has strep/tonsillitis again. This is his second bout in less than 2 months, and last night was one of those horrible nights where he's in so much pain and can't sleep, and his fever is so high...so we bring him into bed with us. Not much shut-eye had by any :( Thankfully it's our day off and my husband is home too. But, gratefully he could be seen right away this morning and when he can keep the medicine down he's at least not moaning! I think with each kid there's some illness that just gets the better of them and this is it for him. I hate seeing my babies sick, when you can't take away the pain. So, we've had lots of cuddle time and naps on the couch for him and juice pops, tomorrow should be better. While he was napping I did a little stamping, I kept it pretty simple because I had limited time. I used both the color challenge colors at SCS (Pear Pizzazz, Crushed Concord and Peach Parfait) and this week's Mojo Sketch, using Verve's One Person set. I decided to do some simple watercoloring using my ink pad lids today, but I'll be honest, I'm a little frustrated with the ink pads in the new In Colors, if you look you can see they really separate out - the Concord really goes blue and a bright purple rather than staying the deeper purple. But, given the day...I just kept going. The colors are actually a little deeper than the photo is showing. I used the panels on top to ink some of the flowers or leaves and then added the little tag on the bottom. I really love this sentiment * I love you exactly the way you are *. All it takes is for your kids to be sick to slow you down and make you want to reassure them that no matter what - you'll be there for them. And being loved for who you are is sure a precious thing isn't it? Recipe: Stamps: Verve - One Person; Ink: Stazon, Pear Pizzazz, Concord Crush, Peach Parfait; Paper: Greenhouse Gala, Flourishes European Watercolor Paper, Big Shot, Deckled Ovals, Large Scalloped Ovals Nesties, Tag, Celery Satin Ribbon, Bow Easy, Glue Dots, Dimensionals, Aqua Painter, Pearls. What a beauty! Love your bold color combo! Hope your son is feeling better. It's still a beautiful card even if you aren't happy with the ink separating. Weird that it does that. I too suffer from strep throat....usually about 2 or 3 times a year! It's miserable. Hope your son feels better soon! WOOWEEE GORGEOUS card!!! Sending well wishes to your son! 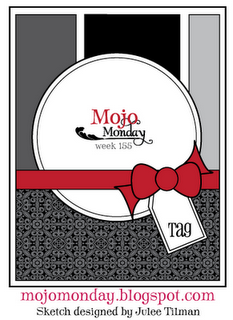 Gorgeous mojo card, Christine, and a wonderful use of the CC. Sorry to hear your little guy isn't well. Wish they would take the tonsils out like they used to - had mine out at 4 and have been healthy as a horse since then. These days you have to get sick about 8 times in one year before they'll even begin to think of taking them out. Hope he doesn't get it again any time soon. Sleeping with a little boy is like being in a sack with a kitten - constant motion LOL! Hope everyone gets a better rest tonite! Bless his heart! Hope he gets to feeling better soon Christine! 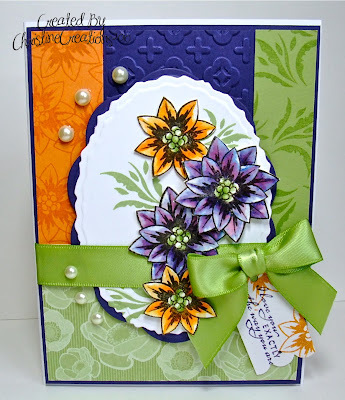 Gorgeous card you made! Lovin what you did with those colors! What a colorful and vibrant beauty, Christine! Magnificent job with the color challenge. I hope your little guy is feeling better soon! 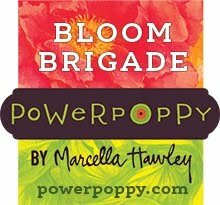 Beautiful work, especially while taking care of a very sick little one! Usually when one is overly tired, their creativity takes a back seat, but not yours! What a beauty this is, Christine! Funny how your "simple" is extremely elegant to me!! Even if the colors separated, the flowers look beautiful! So sorry about your baby. Hope he feels better very soon! Hope your son is feeling better by now, Christine. Gorgeous card, lady! What a fabulous design! STUNNING!! GORGEOUS!! I so love your coloring Christine and the vibrance of your creation. Perfect take on the sketch!! Mine son used to get strep frequently until I read somewhere that after being on the antibiotics for a few days, throw out the old toothbrush. That helped enormously! He was re-infecting himself with his own toothbrush. Good luck and thank you for the beautiful inspirations! Beautiful card ~ I just love the colors! Saying a little prayer for your little guy to feel better quickly! I am sooo sorry your DS is sick....hopefully the meds will take hold and he will be feeling better soon!!!! 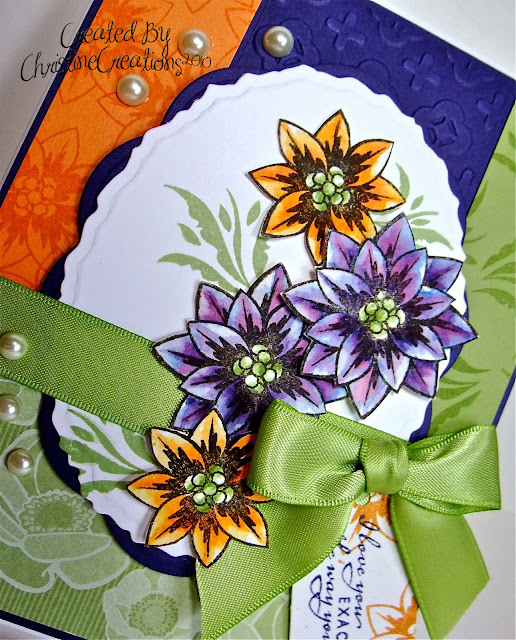 Your card is gorgeous, Christine....your flowers are beautiful and I love how you worked the challenge colors!!! Oh my goodness, how PRETTY! Your cards are always so beautiful and so creative. I get so many ideas from following you. You have a great talent!!! Beautiful card Christine. You have an amazing talent and I get so many ideas from your posts. I look forward to all of your posts.